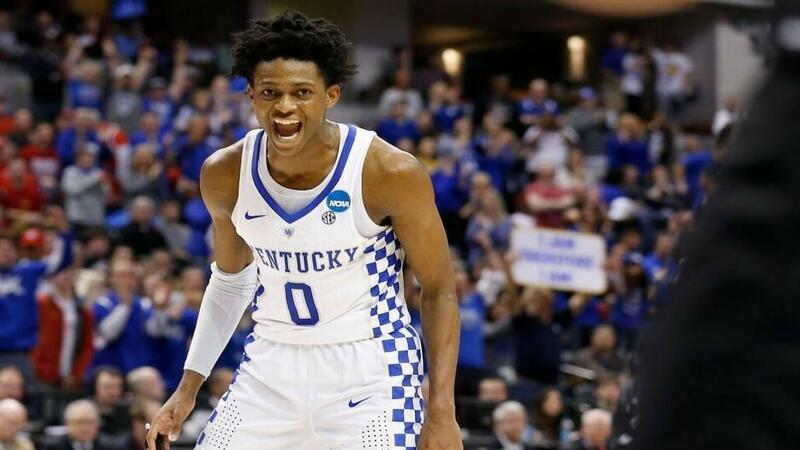 Former University of Kentucky star De'Aaron Fox is one of many Wildcats who went on to be selected in the first round of the NBA Draft. Four Kentucky Wildcats and a U of L Cardinal were among those picked in Thursday's National Basketball Association draft. Two UK stars who left after their freshman seasons were taken in the first round of the draft. Forward Kevin Knox was the number nine pick, chosen by the New York Knicks. Guard Shai Gilgeous Alexander was the number eleven pick. He was drafted by the Charlotte Hornets then traded to the Los Angeles Clippers. UK forward Jarred Vanderbilt was the the 41st pick. He was chosen by the Orlando Magic and traded to the Denver Nuggets. UK’s Hamidou Diallo was picked 45th by the Charlotte Hornets. The guard was then traded to the Oklahoma City Thunder.